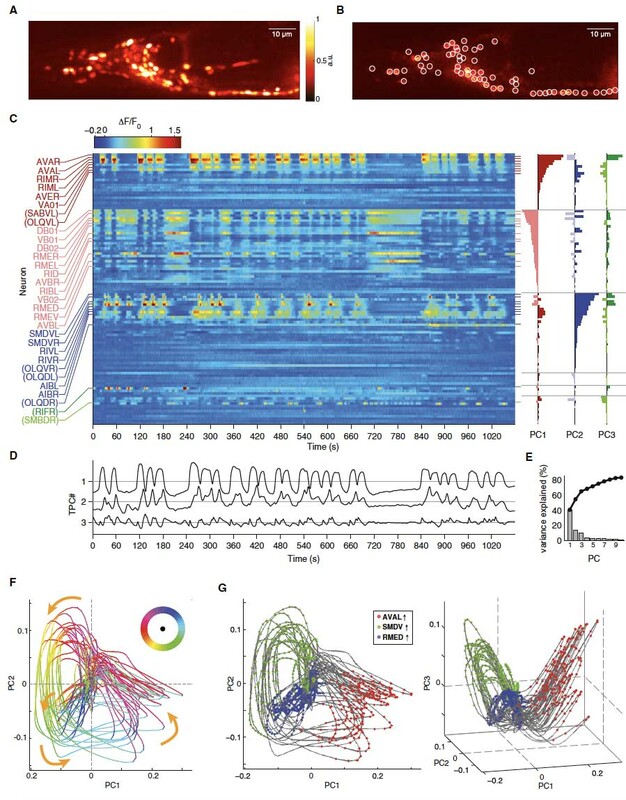 Global brain dynamics embed the motor command sequence of Caenorhabditis elegans. While isolated motor actions can be correlated with activities of neuronal networks, an unresolved problem is how the brain assembles these activities into organized behaviors like action sequences. Using brain-wide calcium imaging in Caenorhabditis elegans, we show that a large proportion of neurons across the brain share information by engaging in coordinated, dynamical network activity. This brain state evolves on a cycle, each segment of which recruits the activities of different neuronal sub-populations and can be explicitly mapped, on a single trial basis, to the animals' major motor commands. This organization defines the assembly of motor commands into a string of run-and-turn action sequence cycles, including decisions between alternative behaviors. These dynamics serve as a robust scaffold for action selection in response to sensory input. This study shows that the coordination of neuronal activity patterns into global brain dynamics underlies the high-level organization of behavior. Regulation of two motor patterns enables the gradual adjustment of locomotion strategy in Caenorhabditis elegans. In animal locomotion a tradeoff exists between stereotypy and flexibility: fast long-distance travelling (LDT) requires coherent regular motions, while local sampling and area-restricted search (ARS) rely on flexible movements. We report here on a posture control system in C. elegans that coordinates these needs. 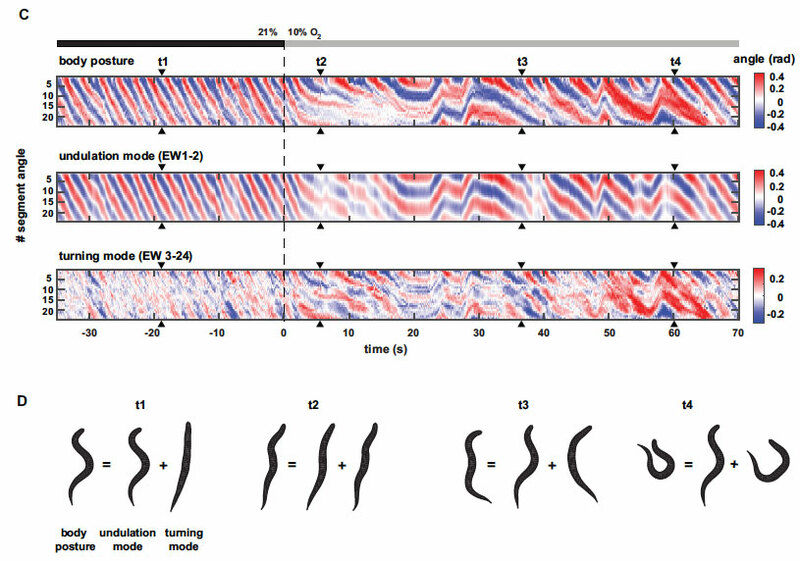 Using quantitative posture analysis we explain worm locomotion as a composite of two modes: regular undulations versus flexible turning. Graded reciprocal regulation of both modes allows animals to flexibly adapt their locomotion strategy under sensory stimulation along a spectrum ranging from LDT to ARS. Using genetics and functional imaging of neural activity we characterize the counteracting interneurons AVK and DVA that utilize FLP-1 and NLP-12 neuropeptides to control both motor modes. Gradual regulation of behaviors via this system is required for spatial navigation during chemotaxis. This work shows how a nervous system controls simple elementary features of posture to generate complex movements for goal-directed locomotion strategies. 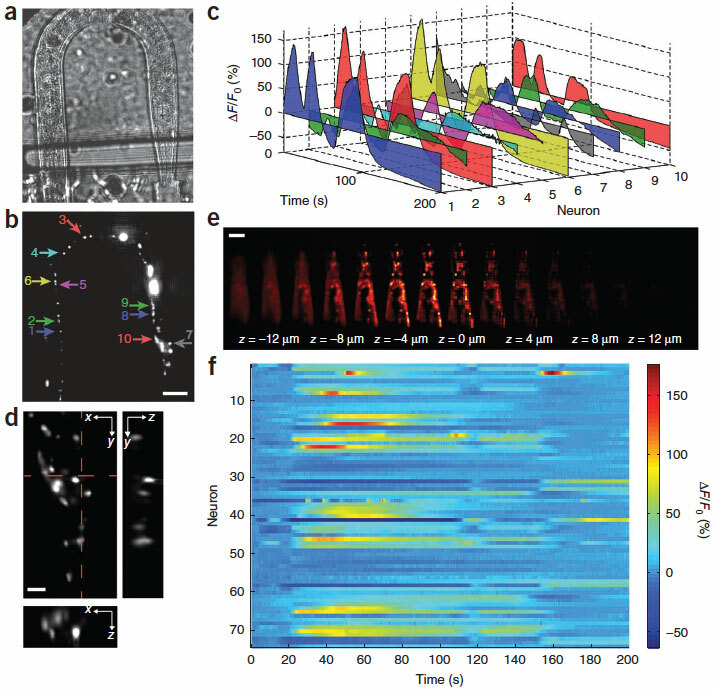 Simultaneous whole-animal 3D imaging of neuronal activity using light-field microscopy. High-speed, large-scale three-dimensional (3D) imaging of neuronal activity poses a major challenge in neuroscience. Here we demonstrate simultaneous functional imaging of neuronal activity at single-neuron resolution in an entire Caenorhabditis elegans and in larval zebrafish brain. Our technique captures the dynamics of spiking neurons in volumes of ~700 mm x 700 mm x 200 mm at 20 Hz. Its simplicity makes it an attractive tool for high-speed volumetric calcium imaging. Temporal responses of C. elegans  chemosensory neurons are preserved in behavioral dynamics. Animals track fluctuating stimuli over multiple timescales during natural olfactory behaviors. Here, we define mechanisms underlying these computations in Caenorhabditis elegans. By characterizing neuronal calcium responses to rapidly fluctuating odor sequences, we show that sensory neurons reliably track stimulus fluctuations relevant to behavior. AWC olfactory neurons respond to multiple odors with subsecond precision required for chemotaxis, whereas ASH nociceptive neurons integrate noxious cues over several seconds to reach a threshold for avoidance behavior. 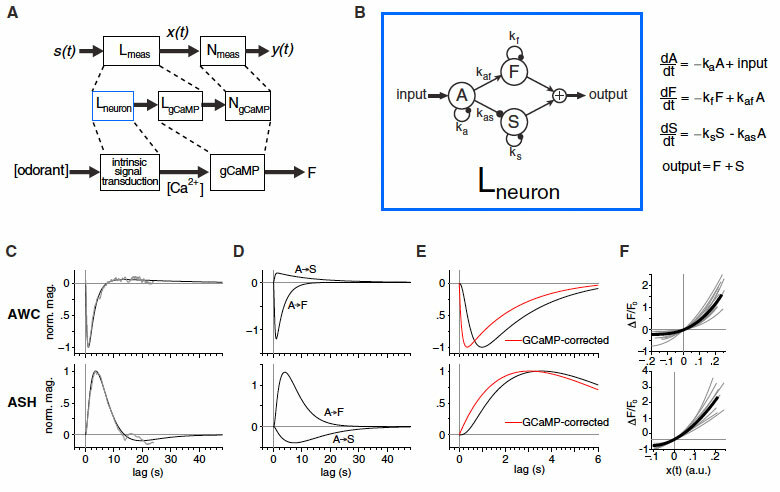 Each neuron's response to fluctuating stimuli is largely linear and can be described by a biphasic temporal filter and dynamical model. A calcium channel mutation alters temporal filtering and avoidance behaviors initiated by ASH on similar timescales. A sensory G-alpha protein mutation affects temporal filtering in AWC and alters steering behavior in a way that supports an active sensing model for chemotaxis. Thus, temporal features of sensory neurons can be propagated across circuits to specify behavioral dynamics.